Photo courtesy GCP&T Bluebirds are just one type of nesting bird that can and will be monitored through GCP&T’s NestWatch Chapter, which is the first in the greater-Dayton region. XENIA — Greene County Parks & Trails (GCP&T) has been named the first official NestWatch Chapter in the greater-Dayton area and the fifth in the state of Ohio. According to staff naturalist Jared Merriman, NestWatch is a citizen science project organized by the Cornell Lab of Ornithology and is dedicated to the study of nesting birds. NestWatch chapters are based at nature centers, parks, wildlife refuges, zoos and nature-minded organizations across the United States. These organizations help teach and train others about monitoring nesting birds in their communities, Merriman said. GCP&T will use its new status to educate others about its bluebird box monitoring program and give its volunteers the ability to enter monitoring data from their smart phone or home computer. As a NestWatch Chapter, residents can use GCP&T as their go-to location for their nesting bird monitoring in all locations — on their front porch, in their backyard or along the paved trails. GCP&T has established bluebird trails at Narrows Reserve, 2575 Indian Ripple, Road, Xenia; Karohl Park, 2940 Hohl Drive, Beavercreek; Spring Lakes Park, 2191 Ferry Road, Bellbrook; Russ Nature Reserve, 2380 Kemp Road, Beavercreek; and Twin Towers Park, 501 Yellow Springs-Fairfield Road, Fairborn. GCP&T partner organizations — Ohio Bluebird Society and Beavercreek Wetlands Association — also have bluebird boxes at Russ Nature Reserve; Koogler Wetland Prairie Reserve, 2735 Beaver Valley Road, Beavercreek; and Phillips Park, 2090 Dayton-Xenia Road, Beavercreek. For more information about GCP&T or its new NestWatch Chapter status, contact the park agency at 937-562-6440, email info@gcparkstrails.com or visit www.gcparkstrails.com. 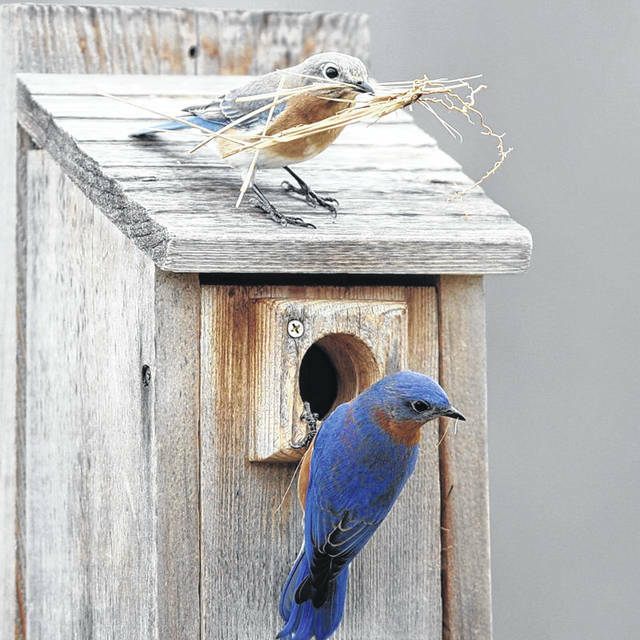 https://www.beavercreeknewscurrent.com/wp-content/uploads/sites/49/2019/02/web1_bluebird.jpgPhoto courtesy GCP&T Bluebirds are just one type of nesting bird that can and will be monitored through GCP&T’s NestWatch Chapter, which is the first in the greater-Dayton region.